Statue of Robin Hood © Copyright Peter Langsdale and licensed for reuse under this Creative Commons Licence. 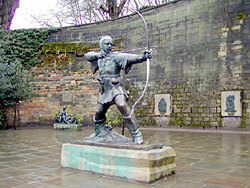 The Robin Hood statue, side bronzes and wall plaques outside Nottingham Castle (photographs of the statue, bronzes and plaques are available here). In August 2015 work began on creating a replica of the statue to be donated to Nottingham's sister city of Ningbo in China. The gift is in return for Nottingham being given two Chinese guardian lions. The statue will be unveiled during the Nottingham trade mission to Ningbo, from 2 to 11 November, 2015. The mould was made by Richard Arm, flexural composites research fellow at Nottingham Trent University. The moulding process will clean the original statue and leave it looking as it did when it was first cast. James Woodfords’s son, James, said: "The family is delighted that one of my father's most iconic works is to be perpetuated in this way and I am sure my father would have been very pleased." The statue of ‘Prosperity’ on the Council House dome. Bronze doors and several relief plaster ceiling panels at the Royal Institute of British Architects (RIBA) building in Portland Place, London (a photograph of the doors and reliefs is available here). The British Medical Association Memorial, in Tavistock Square, London (photographs of the memorial are available here). Various keystone groups for the DEFRA building in Whitehall, London (photographs of the keystone groups are available here). The bronze doors and various relief panels at Norwich City Hall are by Woodford (photographs of the doors and panels are available here). Healdic beasts at the Commonwealth War Cemeteries in Bolsena and Minturno. A circular bronze memorial to Sir Ebenezer Howard on Howardsgate, commissioned by Welwyn Garden City Development Corporation and unveiled in 1964. A photgraph of the monument is available on the Geograph website. 36 and 38 Alfred Street, Nottingham – Woodford’s home addresses as a young man. Nottingham College of Art (now part of Nottingham Trent University).